1 Population estimate includes 816,143 non-nationals. ↑ "Cabinet Ministers". Government of Oman. Retrieved 13 ᱚᱠᱴᱚᱵᱚᱨ 2010. ↑ http://encarta.msn.com/encyclopedia_761561099_7/Oman.html#s28 Fourth line down from the top of the history section: "In 751 Ibadi Muslims, a moderate branch of the Kharijites, established an imamate in Oman. Despite interruptions, the Ibadi imamate survived until the mid-20th century.". Archived 1 November 2009. ↑ "2010 census – preliminary results". 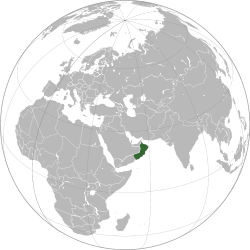 Sultanate of Oman – Ministry of National Economy. Retrieved 7 ᱡᱟᱱᱩᱣᱟᱨᱤ 2012. ↑ ᱔.᱐ ᱔.᱑ ᱔.᱒ ᱔.᱓ "Oman". International Monetary Fund. Retrieved 20 ᱮᱯᱨᱤᱞ 2012. ↑ UNDP (2011). "Human Development Report 2011" (PDF). United Nations Development Programme. p. 132. ISBN 978-0-230-36331-1.